This lovely bookcase offers beautiful traditional style and great storage for your home office. 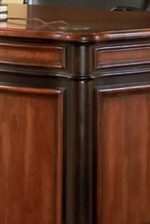 Crafted from select hardwoods and veneers in a rich two tone finish, this sturdy bookcase has three spacious shelves that are perfect for books and decorative items. 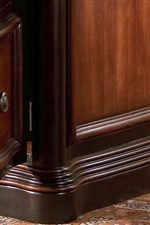 Two lower cabinet doors open to reveal enclosed storage at the bottom of this bookcase, to keep clutter hidden. Clean lines and classic molding give this bookcase a timeless look that will complete your home office ensemble. The Pergola Open Bookcase with Lower Cabinet Doors by Coaster at Carolina Direct in the Greenville, Spartanburg, Anderson, Upstate, Simpsonville, Clemson, SC area. Product availability may vary. Contact us for the most current availability on this product. Construction: Case Crafted from select veneers and hardwood solids.